An economic report released Thursday moves the Residential Infill Project closer to City Council consideration. A rezoning plan working its way towards the City Council would result in almost twice as many new homes being built in Portland over the next 20 years, according to an economic report released Thursday. The new homes would also be far less expensive to rent because they would be much smaller, says the report prepared by Portland-based Johnson Economics. The Residential Infill Project recommendations are currently being considered by the Planning and Sustainability Commission. In recent months, the commission moved to substantial increase the recommended portion of exisiting single-family neighborhoods to be rezoned for smaller multifamily projects, like duplexes, triplexes and four-plexes. The commission originally considered recommending that 60 percent of single-family neighborhoods be rezoned. It has now raised that 96 percent, or almost all of them. The increase would result in 38,115 new homes being built over the next two decades. That compares to 13,665 new homes under the city's current zoning, the report says. "You would expect high rates of redevelop" with the changes, says economist Jerry Johnson, the author of the report. According to the report, under the city's existing zoning, the majority of new homes built over the next 20 years would be single-families houses that would rent for an average of $4,159 a month. If the council approves the recommendations, the majority would be duplexes, triplexes and four-plexes, with the average rent being $1,823 per unit. "The impact on rental residential pricing was highly significant, with average rents dropping by 56% as compared to the default scenario (current zoning), which reflects a change in unit size as opposed to reduced rents per square foot," the report says. The numbers do not include the larger multifamily projects expected to be built along major transportation corridors and in designated urban centers including downtown. The commission is scheduled to be briefed on the report by the Bureau of Planning and Sustainability, which is staffing the project, on Tuesday, Dec. 11. The commission will then hold a work session on the current versions of the recommendations of the project — commonly referred to as RIP — on Feb. 12 of next year. It is expected to vote to approve and send the recommendations to the council on March 12, setting up a series of council sessions and final vote on them over the summer. 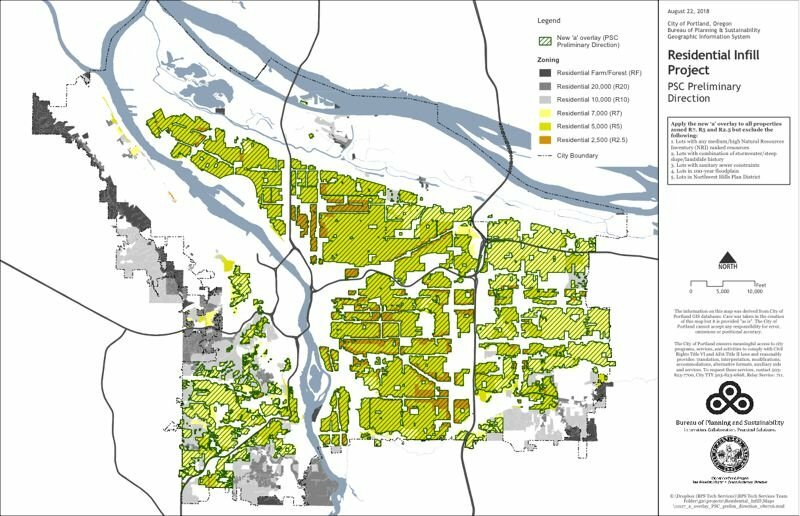 The recommendations are controversial because they would rezone 96 percent of Portland's existing single-family neighborhoods to allow up to four multifamily units on most lots. Supporters say the change will encourage the construction of a greater and more affordable range of housing throughout the city. Opponents say the rezoning will change the character of the city's neighborhoods and encourage more existing homes to be demolished and replaced. The Johnson Economics report predicts a relatively small increase in demolitions if the rezoning happens — from 1,384 to 1,501 over the next 20 years. But the net increase of 24,333 units is much greater because so many multifamily projects will replace them. Almost all of the new units will be rentals, not owner-occupied homes, however. According to the report, few developer are building condominiums anymore because of liability and insurance issues, which are national concerns. You can learn more about the project at www.portlandoregon.gov/bps/67728.